IDEAlliance, the trade association of print and electronic media providers, recognizes Digital Dog Direct for our high standards of printing excellence. G7 Master Qualification distinguishes Digital Dog Direct as a printing company that produces color printing of the best quality and that achieves international color-consistency standards for print media. Learn more about the G7 Master Qualification here. The United States Postal Service awarded Digital Dog Direct with an Honorable Mention in their first ever Irresistible Mail Award™ Competition. The award was given to our team for design and execution of our annual holiday card. Learn more about Irresistible Mail here. 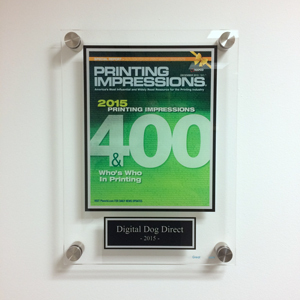 Digital Dog Direct ranked 12th in the Top 100 Quick & Small Commercial Printers by Printing News, a resource for the commercial printing, visual, and graphic arts industries. See the list here. Digital Dog Direct ranked 13th in the Top 100 Quick & Small Commercial Printers by Printing News, a resource for the commercial printing, visual, and graphic arts industries. See the list here.